If you are in Orange Walk and want to know all about parrots, then we've got a forum for you. The Belize Forest Department in collaboration with the Belize Bird Rescue will be holding a very important information session on Tuesday, April 15. The event will be held at the Orange Walk Education Center starting at 5:30 pm. 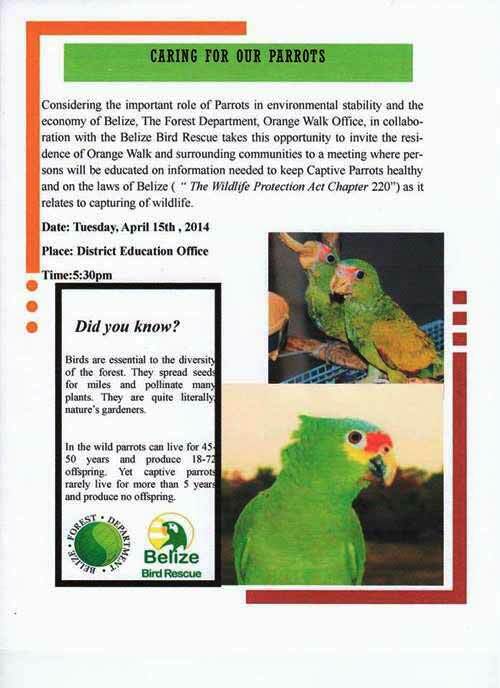 During the meeting, the facilitators will be sharing vital information needed to keep captive parrots healthy and on the Belize WIldlife Protection Act, Chapter 220.